With a global vehicle stock of already more than 1.2 billion vehicles as well as registrations of new vehicles of currently over 90 million units per year, the automotive industry constitutes a dynamically growing sales market for plastics. The replacement of metal, rubber, and glass by plastics reduces weight - but performance remains the same or is even improved. Examples for the application of plastics in the automotive industry are door trim, headlights, switches and handles, seating components, dashboard, windows, and also less visible parts such as plug connectors, battery casings, oil pans, fuel pumps, filter casings, or cooling water tanks. The market research company Ceresana analyzed the market for plastics for this application area in particular: Global demand of the automotive industry for the plastic types polypropylene (PP), polyethylene (LDPE, LLDPE, HDPE), polyurethane (PUR), acrylonitrile butadiene styrene (ABS), polycarbonate (PC), polymethyl methacrylate (PMMA), polyamide (PA), polyvinyl chloride (PVC), as well as other plastics amounts to more than 15 million tonnes. This study registers all parts made of plastics that are produced by either suppliers or vehicle manufactures themselves and are used in road vehicles. The application in passenger cars and commercial vehicles (trucks, transporters, buses, etc. ), both for new productions as well as for spare parts is examined. Ceresana has comprehensively analyzed the market for automotive plastics as a whole as well as the demand for individual types of plastics. Thus, the study offers, besides the demand volume of the individual plastic types, also information on the automotive application areas. The segments seats and upholstery, interior trim, dashboard, bumpers and lighting, exterior trim, under the hood and fuel system, electric and electronics, and others are differentiated. The most important application area in 2015 was the segment under the hood including fuel systems with a demand of approx. 2.6 million tonnes. The highest growth rate between 2015 and 2023 is forecast for the segment exterior trim that is likely to see market volume increase by 4.5% p.a. during the next eight years. 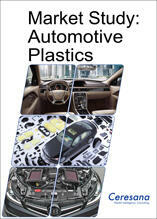 The most commonly used plastic in automobiles is polypropylene (PP). This type of plastic accounted for about 28% of total demand. Over the past eight years, global demand for polypropylene in the automotive industry rose by an average of 3.1% per year. The most important application area for PP in the production of vehicles is the segment bumpers / lighting - this segment accounted for about 30% of total demand in 2015. Products made of the polyethylene types HDPE, LDPE, and LLDPE are used in vehicles mainly under the hood and for fuel systems. Overall, this segment accounts for approx. 45% of demand with HDPE being the dominant product type. With a volume of almost 3 million tonnes, polyethylene ranks first, closely followed by polyurethane (PUR). However, global demand for PUR rose by, on average, 3.6% p.a. Especially, application for seats and upholstery set important impulses. Chapter 1 provides a presentation of the global market for plastics in the automotive industry – including forecasts up to 2023: Data on demand and revenues is analyzed in the regions Western Europe, Eastern Europe, North America, South America, Asia-Pacific, the Middle East, and Africa. Chapter 3 thoroughly examines the application areas for automotive plastics: seats / upholstery, interior trim, dashboard, E&E / others, bumpers / lighting, exterior trim, under the hood / fuel system. These sales markets are split by both the world regions and the most important countries. Chapter 4 deals with demand for the particular types of plastics: polypropylene (PP), polyethylene (LDPE, LLDPE, HDPE), polyurethane (PUR), acrylonitrile butadiene styrene (ABS), polyamide (PA), polyvinyl chloride (PVC), polycarbonate (PC), polymethyl methacrylate (PMMA), as well as other types of plastics. Chapter 5 provides profiles of the largest manufacturers of automotive plastics – clearly arranged according to contact details, turnover, profit, product range, production sites, and profile summary. Extensive profiles of 84 manufacturers are given, for example of Celanese Corp., China National Offshore Oil Corporation (CNOOC), Grupa Azoty S.A., INEOS Group Ltd., LG Chem Ltd., Lotte Chemical Corp., Mitsubishi Chemical Holdings Corp., National Petrochemical Company (NPC), Saudi Basic Industries Corp. (SABIC), and Versalis S.p.A.